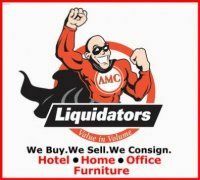 AMC Liquidators - AMC Liquidators is South Florida's premiere liquidation company for hotel/office/home furniture, restoration services, rentals and auctions. CUSTOMIZE the job to fit your schedule and requirements. DELIVER the most efficient and profitable solutions for your needs. SAVE you time, trouble and money. Big Savings! With more than 60,000 square feet of showroom and warehouse space, you'll quickly find an attractive selection for any budget, at up to 90% off retail prices. We BUY! We SELL! Whether you're a buyer or seller, The Liquidator has you covered. Our super trading powers are driven by integrity, knowledge and professionalism. Our super results come from a network of quality suppliers. At AMC Liquidators, value meets volume! Move merchandise with maximum efficiency! By utilizing the latest technologies, AMC expedites your job with maximum efficiency and speed. We're built for today's high-tech commerce. Restorations: AMC Furniture Restoration Services can bring your old or worn furniture back to life. Whether the damage is the result of ordinary wear or caused by water or fire damage, restoration and refinishing is the right choice to save your furniture and the environment. Rentals: Flexible lease terms, Guaranteed Lowest Price (we'll match any competitor price), 48 hour installation (in most cases), FREE professional space planning and a wide selection of inventory. Auctions: Specializing in bankruptcy auctions, we have the capability to cover all the bases, from the removal and liquidation to the careful execution of auction activities on the day of the event. Both live and online auctions. Auctioneering and appraisal company for valuation and liquidation of assets in Florida: Fort Lauderdale, Tampa, Orlando, and Jacksonville. Providing South Florida with quality carpet & flooring since 1968.